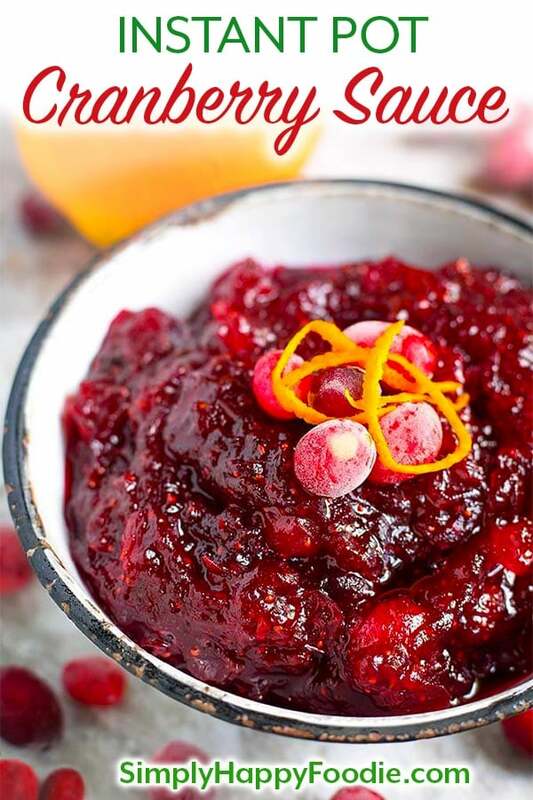 It’s easy to make Instant Pot Cranberry Sauce, even when it isn’t Thanksgiving! It is very easy, and the flavor is bright, sweet, and a little tart. 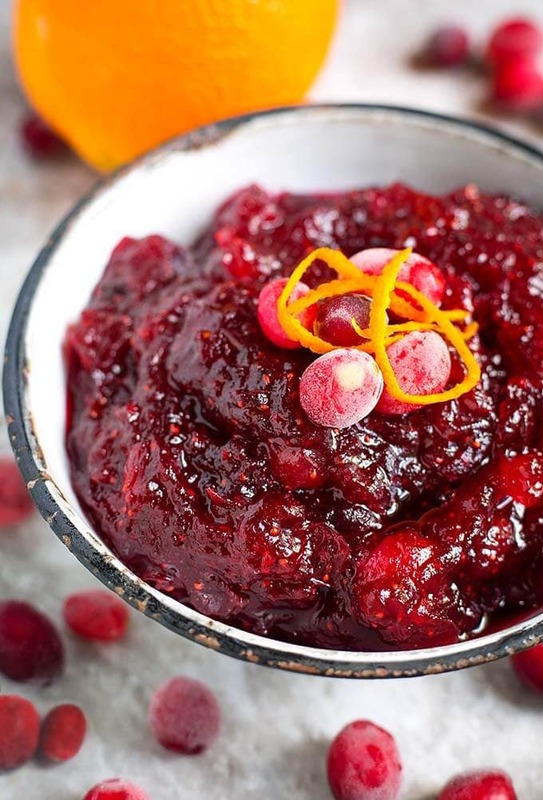 This pressure cooker cranberry sauce goes well with turkey, chicken, game birds, and pork. It is also delicious on a turkey sandwich! If you made this recipe last year, please note that I have revised the method. The ingredients and amounts have not changed. It’s now even easier to make, so it will save you some time! Enjoy! I talk a lot about the cooks who I grew up watching and helping in the kitchen. They were my inspiration. Especially my Nana. She used to make this cranberry sauce in her stove top pressure cooker. I always liked it. Her method required a different way of pressure cooking the cranberry sauce, so I simplified her method for the electric pressure cooker. It’s vey easy and quick. You can even make this the same day you will be serving it, if you need to! Nana’s recipe called for double the sugar that I use. Preferring a cranberry sauce that is much less sweet, I reduced the sugar by half, and that is the sweet spot for me (see what I did there?). I recommend starting with the amount of sugar in my recipe, which is plenty sweet, and adding more to taste, if you like it sweeter. Reduce by 1/4 cup if you want it less sweet. The touch of orange is just right, and doesn’t take away from the wonderful fresh cranberry flavor. If you want a straight cranberry sauce, you can leave out the orange and replace the juice with water. You could also use apple juice, for a different flavor. For the convenience of making this any time of year, you can use fresh or frozen cranberries with equal success. Instant Pot Cranberry Sauce is delicious as an accompaniment to turkey, chicken, pork, and game birds. The sweet and tart taste is enhanced with a hint of orange. Add the cranberries, zest, cinnamon, and juice. Then pour the cup of sugar over the berries, but do not stir. Close the lid and set steam release knob to the Sealing position. Press the Pressure Cook (or Manual) button or dial, and the +/- to select 2 minutes (High pressure). When the cooking cycle finishes, turn the pot all the way off. The berry mixture is a bit foamy at this point, so let the pressure naturally release for at least 5 minutes so the foam can subside. Manually release the remaining pressure/steam in short bursts, until you are sure none of the sauce is going to spew out with the steam. When all of the pressure is out of the pot and the pin in the lid drops, open and stir the cranberry sauce very well. 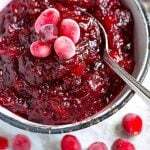 Taste the cranberry sauce after it has finished cooking, and if you like it sweeter, add more sugar, 1 Tbsp at a time, stirring well. Transfer to a serving dish and chill. It will thicken as it cools. This recipe can be doubled. Keep the cook time the same. (Cook time does not include the few minutes it takes to bring pot to pressure, or natural release). Taste the cranberry sauce after it has finished cooking, and if you like it sweeter, add more sugar, 1 Tbsp at a time, stirring well. If you like it more tart, back off the sugar by 1/4 cup. Hi Jerry, I like to use the ceramic coated pot for sticky things, but this cranberry sauce is easy to clean from the stainless pot, too. I don’t use the ceramic coated pot for PIP recipes as I don’t want to risk scratching it with the metal rack. Could this be doubled if using the 8qt IP? Hi Kathy, yes, I think it would work great doubled in the 8 qt! I was thinking about doubling it, too, for a Friendsgiving dinner this weekend. It can be doubled in the 6 qt. can’t it? And if I double it, do I need to adjust the pressure cook time? Thanks! Hi Andrea, yes, you can double it as long as the level is 1/2 of the capacity of the pot or less as cranberries are a “foaming food.” Normally with a foaming food like beans, apples, etc., you can add a little oil or butter to help control the foaming. Not with cranberry sauce. I would not like any fat in my cranberry sauce! So, fill the pot with the recipe for 1 batch, see how full it gets, then determine if you can safely fit in double that amount. It would be really fast to make 2 separate batches if you need to. Also, if you do double it, let it naturally release pressure longer, maybe 15 instead of 5 minutes. Have fun! I made this today. Very easy and tastes great! That’s great, Debbie! Nana would be pretty excited to know people are out in the world making her recipe! We don’t need to tell her that I reduced the sugar, lol! I’m glad it was easy for you, and that you are enjoying it! Thank you for the comment and review! Hi Karen! It is so fun to make! I like it so much more than the canned stuff. Have fun! Would this taste good if made the day before and chilled? Hi Amanda! Yes, it tastes great the next day, and is very good chilled. Even when I used to eat the canned kind, I would put the cans in the fridge to get cold! Of course, then they come out of the can with the little ridges on them, lol! This will last a few days in the fridge in a sealed container. Hi Kadi, yes I have updated the process of making this recipe. It’s now easier, and you don’t have to bring it to pressure twice. I tested it multiple times and am very happy with the results! Same ingredients, and same quantities. Is the 2 minutes pressure cooking on the high setting? Just tried this and used 3/4 cup coconut sugar. It smells and tastes great. Loved not having to watch it on the stove. That’s great! Thanks for the review! I want to make this for the holidays. My pressure cooker needs at least one cup of liquid to get up to pressure.. The recipe doesn’t include enough liquid. Where does the liquid come from? The cranberries pop and release liquid as they heat up and break down, so you don’t need a full cup of liquid to start. If you are concerned, increase the OJ by 1/4 cup, it will still be good, but just a little looser.